Kameron Chatman arrived in Ann Arbor with big shoes to fill. He was the No. 27 ranked prospect in the class of 2015 and he was expected to show up on campus and immediately replace Glenn Robinson III’s production. Freshman forward Kameron Chatman arrived in Ann Arbor with big shoes to fill. He was the No. 27 ranked prospect in the class of 2015 and he was expected to show up on campus and immediately replace Glenn Robinson III’s production. Replacing a player that declared for the NBA Draft after their sophomore is never easy, but Robinson’s contributions and talents had also been largely overlooked by Michigan fans.The 6-foot-6 sophomore had scored most of his points off of alley-oops and in transition, but his ability to finish around the rim was elite and vital to the Wolverines’ NCAA-leading offense over the past two seasons. 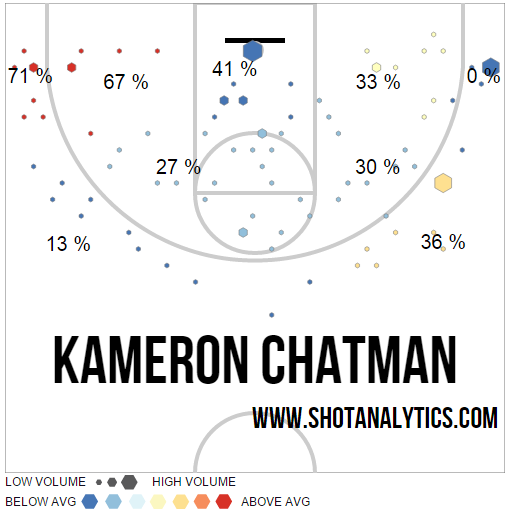 Kameron Chatman is nothing like Glenn Robinson III and Michigan fans learned that very quickly. Although Chatman earned Beilein’s endorsement as a ‘rotation player’ during the summer trip to Italy and was named an opening day starter, it didn’t take long before it was clear that he was in over his head. Chatman averaged 3.6 points, 2.5 rebounds and 0.7 assists per game as a freshman and saw his playing time decrease as the season wore on. Here’s how he compares to other incoming top-50 recruits last season. That graph is pretty ugly as there were only a handful of top-50 prospects who posted per game scoring averages worse than Chatman’s freshman season. And it wasn’t like Michigan didn’t need any extra minutes or production. Chatman fell out of the starting lineup midway through the season and wasn’t able to earn minutes even when Michigan’s roster was ravished by injuries. Passing Ability: Chatman might not have posted gaudy assist numbers, but his passing ability was still evident. He had twice as many assists as fellow four-man Aubrey Dawkins despite playing roughly 75% as many minutes. While 22 assists in a season is nothing to brag about, Chatman’s vision and passing ability were still ahead of most of his freshman teammates. In the future, perhaps as soon as this season, it will be that passing ability which helps Chatman find a niche. Rebounding: Chatman grabbed 16.5% of defensive rebounding opportunities when he was on the floor — a mark only topped by Derrick Walton — and was also able to grab a few offensive rebounds as well. He has the ability to be a more consistent rebounder and even in limited playing time has shown better rebounding ability than some of Michigan’s other wings. Finishing: Chatman shot just 41% at the rim as a freshman and that’s not going to cut it for a 6-foot-7 kid playing the four, especially when he was replacing Robinson’s 71% finishing clip from the previous season. The four position in Michigan’s offense is designed for a lot of quick hitters and easy basket plays and Chatman didn’t have the ability to convert those at a high clip. Shooting: Chatman shot 34% on mid-range jumpers and 26.3% on three-point jumpers. Both of those numbers are pretty ugly — especially from long range — and will need to improve in the future. Michigan’s offense relies on multiple guys who are capable of sticking jump shots and Chatman wasn’t even close on some of his attempts as a freshman. Inconsistency: Chatman’s best plays were usually followed by a mistake or defensive breakdown. He had a hard time adjusting to the pace and intensity of the game on both ends of the floor which meant he was never able to put together long stretches of consistent play. Chatman tallied 10 points, nine rebounds, two assists in Michigan’s 68-65 win over Syracuse. Chatman’s freshman season couldn’t have gone much worse. He was tagged with high expectations out of the gate and despite a few early season flashes he generally regressed as the year wore on. He showed flashes down the stretch with three or four quality performances in the final month of the season — but overall he failed to impress. Aubrey Dawkins outplayed Chatman in the second half of last year and is now penciled in as the starter at the four position. DJ Wilson missed last year with an injury redshirt and now will be angling for minutes at the four and five positions. Moritz Wagner is coming across the Atlantic and will want to play the four position. Duncan Robinson sat out last season and excels in one of the areas where Chatman struggles — shooting — and will want a spot in the rotation. Chatman might improve, but where is he going to find a role? He’s probably not going to shoot the ball better than Dawkins or Robinson. He’s not as big as Wilson or Wagner. Somewhere, somehow Chatman has to find his niche in the offense. If he’s going to make an offseason transformation it’s going to need to be both mental and physical. Physically he needs to get stronger and more athletic to allow him to finish plays around the basket. One of the hardest things for freshman to grasp in the college game is the importance of not making mistakes. Playing 35 minutes without without filling up the stat sheet is oftentimes better than scoring 8 points and making five mistakes. There are roughly 65 defensive possessions in a game and most mental mistakes at this level result in an automatic two points or a lost possession. Possessions are the name of the game and giving away possessions leads to losses. Mistakes plagued Chatman throughout his freshman season and if he’s able to eliminate some of those mistakes he could make major strides. Making a few more jumpers certainly wouldn’t hurt, but the 6-foot-7 forward from Oregon needs to start by doing the little things and letting the rest fall into place. There’s certainly the talent there to make an impact, but he’ll have to work his way back into the rotation given Michigan’s depth on the wings.